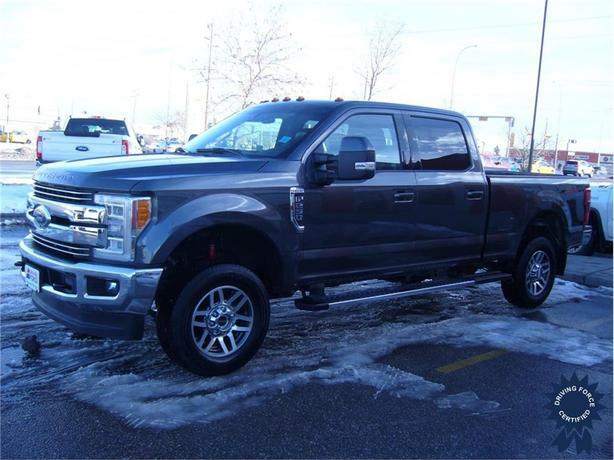 This 2017 Ford F-250 Lariat FX4 Crew Cab 6 Passenger 4X4 6.8-Foot Medium Box Truck comes with a 160-inch wheelbase, TorqShift-G 6-speed automatic transmission with over-drive and SelectShift, tow/haul mode, electronic transfer case, electronic-locking with 3.73 axle ratio, 18-inch bright machined cast aluminum wheels, heated and cooled leather 40/20/40 split bench seat, Lariat Ultimate Package, FX4 Off-Road Package, transfer case and fuel tank skid plates, adaptive steering, twin panel moonroof, tailgate step and handle with tailgate assist, 6-inch chrome angular extended length running boards, power extendable trailer style mirrors with heat, convex spotter, and turn signal indicator, navigation, remote start system, block heater, HD 200-amp alternator, Class V towing equipment with harness, hitch, brake controller, and trailer sway control, front anti-roll bar, firm suspension, auto locking hubs, deep tinted glass, chrome grille, power rear window with defroster, front fog lamps, SYNC 3 Communications and Entertainment System with enhanced voice recognition, 911 Assist, AppLink, 8-inch Color LCD Touch Screen in centre stack with swiping and pinch-to-zoom capabilities, 2 smart charging USB ports, 10-way power adjustable driver and front passenger seats with power recline, height adjustment, fore/aft movement, cushion tilt and power 2-way lumbar support, cruise control with steering wheel controls, three 12V DC power outlets, full carpet floor covering, power door locks with autolock feature, remote keyless entry, heated steering wheel, WiFi hotspot, smart device integration, keyless start, rear parking sensors, tire specific low tire pressure warning system, backup camera, 3,350 lbs Maximum Payload, and GVWR rating of 9,900 lbs (4,490 kgs). The 6.2-litre V8 gas engine provides 385 horsepower at 5,750 RPM and 430 lb-ft of torque at 3,800 RPM. Touch base with us to discuss purchasing or financing options that are right for you and experience the difference you will only find at DRIVING FORCE Vehicle Rentals, Sales and Leasing.